Baduzzi is the Sicilian word for meatballs, but this Italian restaurant is not the loud and raucous family affair the name may conjure up. There is no grandmotherly figure filling your plate with huge and hearty portions of food. Rather, it is an elegant and sophisticated place with a relaxed atmosphere, where you can savour your meal rather than shovelling it down. Front door to this classy yet inviting restaurant. The service is excellent. When we turned up one night, and the only table free was outside, right by the wind tunnel of Fish Lane, the owner brought over a woollen blanket to keep us warm. When someone dropped a fork, a new one magically appeared. If you have four people at your table, and order meatballs which normally comes as a set of 3, the wait staff always check whether you want to add an extra portion. Plenty of drinks to choose from too. The menu is divided into a number of sections, with only one featuring meatballs. All are delicious, and I like the fact that nothing is so huge that you cannot eat anything else. You could treat the small dishes as entrees, or you could get a bunch of them to eat as tapas. As with everything else at Baduzzi, they are flavourful, well-presented, and simply a pleasure to eat. Half of a dish of flame grilled sardines. Breaded courgette flowers, with additional portion. The crayfish meatballs are apparently the restaurant's signature dish. We tried these only once, at the Taste of Auckland festival, where I was amused they painted on a swoosh of spring carrot puree, even though they were using paper bowls. This dish at the event was about $4 cheaper than dining in, but was not as amazing as we had expected for a price tag of nearly $5 per ball (after paying the entrance fee), especially when you are using plastic cutlery, perched at makeshift tables. Perhaps the surrounding atmosphere interfered with our taste buds. Crayfish meatballs with braised chickpeas. The wagyu meatballs we ate at the restaurant, however, were juicy and delicious, worthy of the restaurant's name. Wild deer meatballs, portabello mushroom, cauliflower crema. We had expected the meatballs to come with pasta or other form of carbohydrates, but what you see is what you get. These dishes therefore do not make a balanced lunch, but would be a great starter to share. 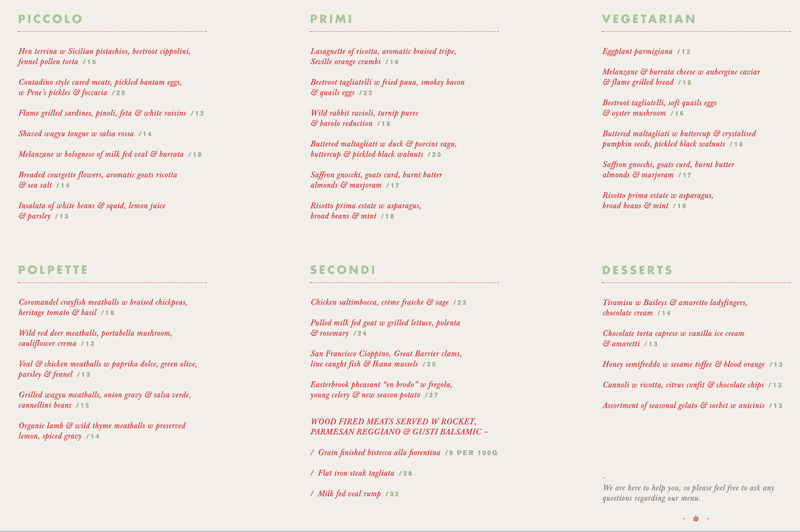 The first course section comprises mainly of pastas, and overlaps significantly with the vegetarian menu. There is absolutely no need to eat meatballs to enjoy a great meal at Baduzzi! Risotto with asparagus, broad bean and mint. Saffron gnocchi w goat curd, burnt butter, almonds and herbs. Likewise, the wild rabbit ravioli were more like meatballs in disguise, with plenty of filling in a tall lump, with a token pasta wrapping. Wild rabbit ravioli, turnip puree, barolo reduction. Close-up of an opened rabbit ravioli. The items in the second course section focus on meat, and despite the price, are not necessarily much larger in size than the previous dishes. Pulled milk fed goat with grilled lettuce, polenta and rosemary. Pheasant "en brodo" with fregola, young celery & new season potato. I am thankful for the relatively small portion sizes, because the desserts at Baduzzi really stand out. They are presented in a fun and artistic manner, and taste as good as they look. Tiramisu with Bailey's & amaretto ladyfingers, chocolate cream. Cannoli w ricotta, citrus confit & chocolate chips. Chocolate torta caprese with vanilla ice cream & amaretti. There are many mediocre restaurants on North Wharf, but fortunately Baduzzi is not one of them! This restaurant may be named after meatballs, but the other sections of the menu are just as enticing. Make sure you save room for dessert! Baduzzi is one of a row of restaurants at the bottom of the ASB Building at North Wharf.